Makhno, Nestor and Alexandre Skirda. 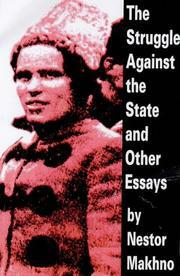 The Struggle Against The State And Other Essays . AK Press: 1996. 114 pages. Translated by Paul Sharkey. A collection of essays and articles written while in exile in Paris in the 1920s. Sheds valuable insight onto the man and the movement that bore his name. He responds to all sorts of accusations, including his alleged anti-Semitism, and continues his exhortation for an organized, relevant, revolutionary anarchist movement. 9781873176788 Not currently available. Find at a local library. Makhno, Nestor. My Visit To The Kremlin . Skirda, Alexandre. Nestor Makhno – Anarchy's Cossack . KSL: Bulletin of the Kate Sharpley Library No. 26, March 2001 . KSL: Bulletin of the Kate Sharpley Library No. 9, 1997 . KSL: Bulletin of the Kate Sharpley Library No. 23, July 2000 .